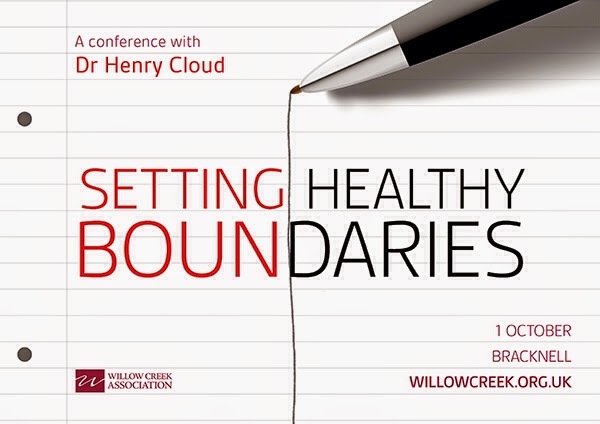 I'm really excited that on Wednesday 1st October clinical psychologist Dr Henry Cloud is going to be with us at the Kerith Centre in a Willow Creek hosted event. Many of us have hugely benefitted from Henry's teaching at the Willow Creek GLS over the last few years, as well as being helped by his many books. In particular his book Boundaries has been hugely helpful for me as I try and learn when to say yes and when to say no in my own life, and how not to get overrun by the demands and expectations of other people. Anyone who listened to Shauna Niequists final session at the REAL women's conference will have heard her take on some of his teaching. If you want to see Henry in action, get more details on the conference and book in then please take a look at the Willow website here. If you need the Kerith login details to get the members rate (and you're a part of our community!) then email reception at info@kerith.co.uk to get them. I realise that this event is only 9 days before we host the Willow Creek GLS (more details on that, and a special Kerith rate, soon). If you can only make one event I'd tentatively suggest prioritising the GLS, but if at all possible please think about coming to both events - I promise you won't regret it.